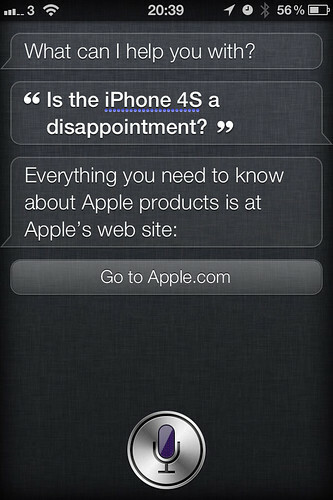 The iPhone 4S is not designed to make the IT Industry happy with Apple. A while ago, while Apple were doing the iPod thing and their machines were still the main asset, the running joke about Apples was that they were obsolete before you got them home. Computers in general, sure, but Apple machines in particular. Now, the industry press is choc-a-block with disappointment for the new iPhone 4S, because there’s not much of a compelling killer-feature for someone who already has an iPhone 4. My first iPhone – a 3G – was on an 18 month contract. This iPhone – a 4S – is on a 24 month contract. The vast majority of people buying the iPhone 4 won’t have had it given to them for review purposes, or bought it Sim-Free from the Apple store. They’ll have got it though their network on an 18 to 24 month contract. If they bought it on release date, that’ll expire June 24 2012 (Or July, if they were on CDMA. Or the following April if they bought it in white). The 4S isn’t designed to be a must-upgrade from the iPhone 4. It doesn’t need to be, and probably shouldn’t be. It’s a compelling upgrade for people with a 3G, or 3GS, though. If we turn that onto the Android market and attempt to apply the same values, it gets a little strange. It’s almost impossible to have a top-of-the-line Android handset for more than two weeks right now, and at one point last year the top-range HTC models were being released *after* the next level of phones had been annouced for release the following month. All of these phones, unless you have the disposable income to drop on the unlocked versions, come with a 18 to 24 month contract. If I hadn’t bought my original-model Desire unlocked, I’d have another six months before I was able to switch, and that would be to a phone that HTC stopped supplying OS updates to a year ago, and didn’t even bother patching for the most recent security lapses. So I won’t be getting an iPhone 5, because when it comes out I’ll be halfway though the contract for this one. But I’ll probably be right in line for the 5S, even though ZDNet & Engadget think it’s a “Disappointment”. Do you think that the apparently 40-odd % of iPhone4 users who get a 4S will be disappointed? Not seen that statistic, and it would surprise me if true. People expecting a revolution will be disappointed that they aren’t getting one. However, it’s a faster phone with a far better camera, even discounting how useful Siri might turn out being, so probably not.